superdumb supervillain: Rainbow Brite Is Back! Not so very long ago, a little girl name Wisp appeared in a colorless and unhappy world. Through courage, kindness and friendship, Wisp became Rainbow Brite and transformed the unhappy world to Rainbow Land, a magical place where all the colors in the universe are created. Now, Rainbow Brite is one of Rainbow Land’s four Sky Powers, characters whose magical powers determine the cycles of Rainbow Land’s days and seasons. 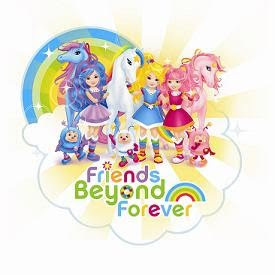 With the help of her friends, her magnificent horse Starlite, and her magical Color Belt and Star Scepter, Rainbow Brite travels to the far corners of the universe, bringing hope and happiness to everyone she meets. No matter where you are, you can always count on Rainbow Brite to make your heart a little lighter and your world a little more colorful! I remember Rainbow Brite from the '80s as a cheerful little moppet with an optimistic point of view. Hallmark has brought her back for Roo's generation, but with a sleeker, more "tween" look. Still sporting those flashy moonboots and perky topknot, though! I love the bright colors and happy message. The new dolls and accompanying ponies look pretty cute, too. Disclosure: We received a CD featuring Rainbow Brite games and activities and extra copies to share with Roo's friends. You can play some free Rainbow Brite games online, too. Love that she has gone the way of Dora, too. A older, more mature girl. 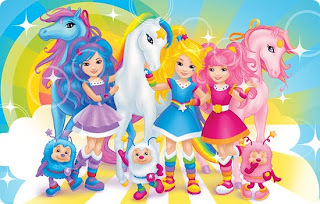 Wow...I use to love Rainbow Brite when I was a kid, it brings back alot of memories. I loved these as a kid too, especially those puffy boots. I like seeing toys I grew up on making a comeback.